Kyle Medcalf will be a key man for Peterborough Town seconds at East Haddon. Peterborough Town complete their season this weekend with home games against Wellingborough Town in the Northants Premier Division tomorrow (September 17) and Market Deeping in Rutland Division One on Sunday (September 18). 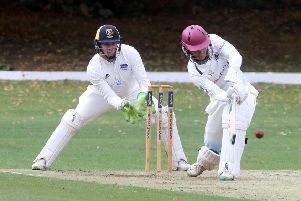 Town can still clinch a top two finish in the Northants Premier Division for the fifth season in a row, but the club could be distracted by the plight of their second team in Division One. Scott Howard is a Peterborough Town regular. The city side are two places and four points above the relegation zone ahead of their final match which is at next-to-bottom East Haddon. Town seconds haven’t won since June 25, a run of 11 matches. Town’s senior side will finish second if they beat relegated Wellingborough and Finedon lose badly at champions Old Northamptonians. Division Two rivals Baston and Freiston square off in the South Lincs League Cup Final at Bourne CC on Sunday. It’s a 40-over game at the Abbey Lawns starting at 1pm. Burghley Park will win promotion from Rutland Division Three by picking up three points from the visit of lowly Long Sutton. (11.30am) Premier Division: Brixworth v Oundle. Peterborough Town v Wellingborough. (1pm) Premier Division: East Haddon v Peterborough Town. (noon) Division Three: Oundle 2nds v Brixworth 2nds. (12.30pm) Division Eight: St Michaels 74 v Oundle 3rds. (1pm) Premier Division: Belton Park v Market Deeping 2nds, Bourne 2nds v Long Sutton, Grantham 2nds v Stamford. (1pm) Division One: Skegness v Welby Cavaliers, Timberlands v Baston. (1pm) Division Two: Burgh & District v Spalding 3rds. (1pm) Division One: Peterborough Town v Market Deeping. (1pm) Division Three: Bretton v Stewart & Lloyds, Burghley Park v Long Sutton. (1pm) Division Four: Hampton v Easton-on-the-Hill, Kimbolton v Bourne 2nds, Orton Park v Loddington, Thrapston v Nassington 2nds. (1pm) Division Five: Castor 2nds v Sawtry, Market Deeping 2nds v Market Overton. (1pm) Division Six: Long Sutton 2nds v Moulton Harrox 2nds, Ufford Park 2nds v Orton Park 2nds. (1pm) League Cup Final: Baston v Freiston.